Naugahyde®, the pioneer and premium brand in the coated fabrics industry, is dedicated to world-class surface pattern design and technical innovation resulting in products with superior quality, outstanding durability and exceptional performance. Our reputation as a technical innovator is evident by our leading-edge top coat finishes which offer remarkable stain and abrasion resistance. 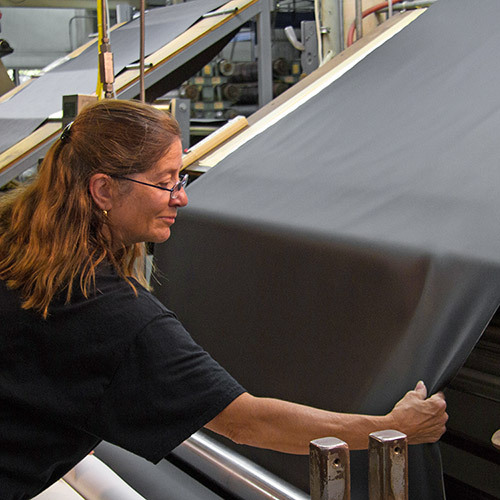 All Naugahyde products are proudly made in the U.S.A. at our Stoughton, Wisconsin manufacturing plant. In 1914, an exciting new product was developed at the U.S. Rubber Company plant in Naugatuck, Connecticut. Since it looked like a hyde and was made in Naugatuck, these two words were linked and Naugahyde was born. Naugahyde products combine style, durability and quality and are available in a variety of designs, patterns, and colors. Designers and specifiers are encouraged to review products, build design sheets and order samples. Naugahyde, a true American classic, is "Made in the USA" at our Stoughton, Wisconsin manufacturing plant. We are proud to carry on a tradition of quality craftsmanship and technical innovation that spans more than 80 years. Our teams, consisting of many long-time employees and even multiple generations, are dedicated to providing high quality products and outstanding customer service.